If you are an adult who cannot swim, you are not alone. In 2015 the Amateur Swimming Association (ASA) released the results of a survey which suggested that one in five adults in England can’t swim – but the good news is it really is never too late to learn! We believe there is a problem in the UK with many adults now not being able to swim and with more and more children not learning either, the issue is only set to get bigger. It is believed that around nine million adults in England never learnt to swim, or had such bad lessons that they never continued, meaning that as an adult they no longer have the skill. There are probably more than the 22 we've listed but think about how fabulous it would be for all the family to be able to swim, have so much fun while being safe in the water at home, in your local pool or especially on holiday ion the pool or the sea. There is really no substitute for the fun and laughter I have with my kids in the pool at my local pool or on holiday. It’s worth noting that teaching has come on leaps and bounds in recent years and more adults are now taking the plunge. With many different types of lessons for adults, ranging from overcoming a fear of water, to beginners swimming, to learning to float, dive and even improve stroke. It really is nothing to be ashamed of and in fact this year we are urging all non-swimming adults to make the time to learn because you won’t regret it! 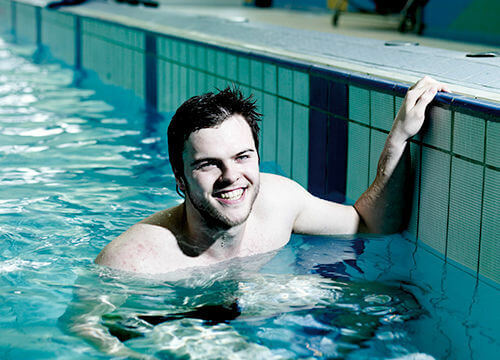 At Freedom Leisure we have helped thousands of adults to start swimming. I thought I was too old to learn how to swim at 43 but after my family bought me lessons for my birthday, it has been a great journey! My progress in the water was better than I could have imagined and it’s down to the swimming instructors at Freedom Leisure! Learning to swim is like learning any new sport or activity – you wouldn’t try horse riding or skiing without lessons would you? It is best to have a professional qualified tell you exactly want to do. This way you start off on the right foot with no bad habits, and if you can’t swim at all how you can possibly know what you don’t know? Booking a proper lesson proves to yourself that you are serious about learning and it gets you guaranteed time in a pool. Also you’ll see that you’re not the only one who is trying to learn. This may sound a bit cheesy but learning to swim as an adult requires you to really want to do it. It’s not difficult because anyone really can learn to swim if they want to, but it requires effort and possibly stepping out of your comfort zone. It can take a little while to master, again just like learning to ski – would you expect to jump on skis and head straight down a mountain without falling? So we think the most important thing is not to give up. Before you start trying to swim just go and spend some time in a swimming pool getting comfortable in the environment and with putting your face under the water. Again sounds simple but it’s a really worthwhile exercise. You are going to have to put your face in water and it is much better for your neck and back to swim with your face in the water than held up at an unnatural angle. Invest in some goggles and start swimming this way from the beginning, you’ll strokes will be better in the long run too. First things first, if you do have any worries or fears, then tell your swimming instructor about them, do not feel embarrassed. Many people have fears as a result of bad experiences as a child and an instructor can help you overcome them. Sometimes the worries you may have are the biggest hurdle to overcome – nail these and the swimming is the easy bit. There really is nothing to be ashamed about when learning to swim, in fact the very fact you are doing it as an adult is an achievement and something to be proud of. While adults can certainly grasp certain concepts and skills better than children, they may often have a more deep-rooted fear, low-confidence and uncertainty about things like; what they look like in a swimsuit or how silly they might look while learning. We say please don’t let these things hold you back. Find out about Freedom Leisure’s adult and child swim lesson programme by clicking the link below. Tue 2 May How to really change your body and improve your confidence for summer – in just 10 weeks!